The heated debate between Key West, Miami and Tampa over which city has true bragging rights to being the birthplace of what is commonly known as the Cuban sandwich will likely never be settled. But one thing all fans of this crispy, tasty, meaty treat can agree about is how satisfying, filling and truly delicious this popular sandwich can be, especially when made with the proper bread, the correct combination of fillings and freshly made-to-order. Even here in its hometown of Tampa the Cuban sandwich can, and does, seem to have more than one identity. Some request it pressed and hot. Others go for it cold. Pickles or no pickles? Mustard and butter only, please, or is it alright to mix in a little mayo? Fortunately there is a homegrown festival that welcomes all versions of this versatile sandwich while honoring its history and heritage. And it’s a competition that attracts culinary contenders from around the world to test their sandwich-making skills and create their take on Tampa’s signature Cuban sandwich to make it stand out from all others. 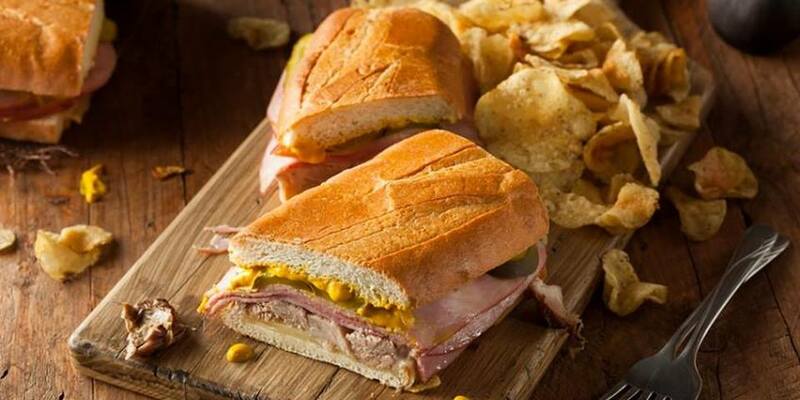 The 8th Annual Cuban Sandwich Festival returns to Ybor City's Centennial Park on Sunday, March 31st. It is, literally, a celebration of the biggest and the best. The main competition takes place on Sunday but Saturday, March 30th, marks the Taste of the Cuban Sandwich festivities at Centro Asturiano when youngsters vie for victory in a separate sandwich showdown and tables are lined up, loaves of La Segunda Bakery’s Cuban bread are placed end-to-end and a team of folks will attempt to build a 175-foot Cuban sandwich. If successful, that effort will eclipse the existing World’s Largest Cuban Sandwich record of 162 feet. Imagine how much meat, cheese and condiments will be needed to layer on each crusty loaf. This Tampa Bay-based chef showcase event gathers some of the finest purveyors of Cuban sandwiches from around the world who arrive here in hopes of winning in one of the following categories: most popular, traditional or non-tradition Cuban sandwich. Contestants have been known to trek to the Tampa Bay area from as far away as Seoul, South Korea and London, England as well as from across the U.S.
How did Tampa become so synonymous with Cuban sandwiches? The immigrants who settled in Ybor City and worked in the cigar factories that made the area world famous, are credited for inspiring the combination of ingredients that define this iconic sandwich that has stood the test of time in terms of on-going popularity. Of course there will be lots of musical entertainment, domino tournaments and various vendors throughout the weekend but, let’s face it, crowds mainly come for the food. Admission to the festival is free but for a true VIP experience, purchase tickets and enjoy all sorts of refreshments, private access, a chance to mingle with special guests and red carpet moments. Seeking even more events in Tampa Bay? Simply register at 727area or 813area. It’s easy and free!